Couscous is a spicy dish that originated in northern Africa; consists of pasta steamed with a meat, chicken and vegetable stew. It is a combination of semolina wheat and water which looks and taste more like pasta made in northern Africa, the Middle Eastern cuisine of crushed and steamed semolina ingredient. There are different types, most common are the large Israeli couscous (aka pearled couscous) and the small Moroccan couscous dish (about 3 times the size of cornmeal). Eating it provides you with essential nutrients to help maintain your overall health. 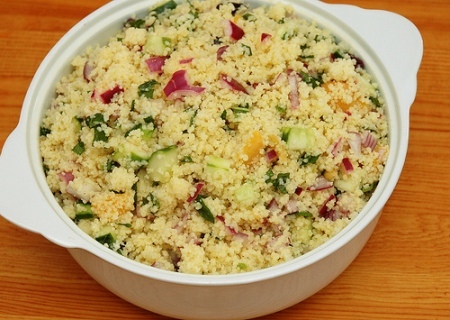 Couscous is rich in vitamins and minerals like calcium, phosphorus, selenium, potassium, magnesium, folate, and proteins. Let’s see some of the amazing health benefits of couscous. Today, in Egypt and the Middle East, it is well known, but in Tunisia, Algeria, Morocco, and Libya couscous is a staple. It is the national dish of the Maghreb countries. It is a traditional Moroccan dish of semolina which is cooked by steaming. 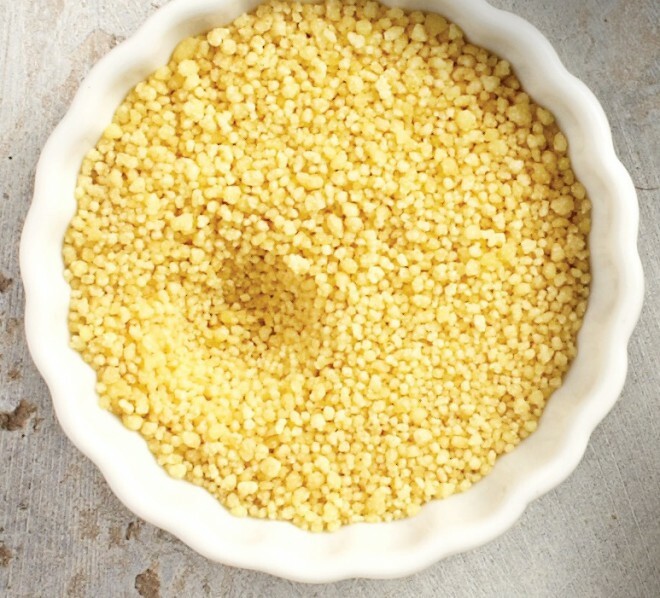 The United States, Britain, and other nations of the world typically get couscous in pre-steamed or prepared varieties, so a small amount of hot water is required to fluff up the pre-cooked and dried couscous balls. It is a good source of lean, vegetarian protein. Protein helps repair and build tissues in your body. Protein plays a very important role in replacing dead cells in your body. Also, it is a good source of potassium. The potassium in it helps in regulating blood pressure and the heartbeat. Potassium reduces stress, anxiety, helps control fluid balance, an important factor in blood pressure regulation. Selenium is a trace mineral that is very difficult to find in food sources, but couscous is the richest source of selenium and gives more than 60% of the daily suggested intake of selenium in one serving. In terms of heart health, selenium functions as a powerful antioxidant that functions mainly in the blood vessels to reduce the buildup of plaque and dangerous LDL cholesterol on artery and vein walls. The rich fibre content in it acts as a deterrent to the secretion of ghrelin, the hormone which generates feelings of hunger. Fiber may be beneficial for weight management because it absorbs water and swells in your digestive tract helping you feel full. Being rich in selenium a trace mineral plays a key role in the metabolic pathways which lead to proliferation or protection of certain cancers. Recent studies have linked a deficiency in selenium in the body to increased risk of prostate cancer appearance.